MUST WATCH: A Prophet Shared Her Prophecy About the Election! As normal human beings, we do not know clearly what will be our future. The outcomes that a person may see what will happen next are still based on what happened in the past and currently happens in the present. However, there are some who claim that they have the ability to do it because of God's will, as they are so-called prophets. A fascinating but alarming prophecy regarding the May 9 Philippine Election has seen by honoring Dr. Cindy Jacobs. But before we discuss her foresight in the upcoming election, let us know a little about her. According to Generals International (GI) (reference: www.generals.org), Cindy Jacobs is an author, speaker, and teacher in the areas of prayer and prophetic gifts. She, with her husband Mike co-founded this prayer-based organization in 1985 for the purpose of changing lives and transforming nations. 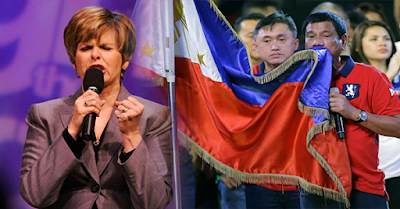 Jacob's prophecy about the Philippines was remarkable that we need to be aware of. She mentioned that God forwarded a message to inform the faithful Filipino people that the country is enclosed with the "Principality of Corruption". In line on what she said, she encouraged everyone to pray in order to choose what is best for our country when it comes to its leaders. In addition, she said that for the next few years, the country will experience great times, but still with pressure such as violence and threats. She also said that thru God's help, the evil acts will be cleared out as it is to break the tie on corruption the country has. Because of the pure intention of the citizens of the country, still the nation will still be guided by the light God has given to his followers. Each of us is aiming for a nearly perfect country in which everyone feels that there is progress. That is why, it is part of the responsibility of Filipinos to vote who should be the right one. In fact, whoever wins, even though it is different from the one you voted, for instance, still needs everybody's support and cooperation. There is no sense of this election if that will not be the outcome and it seems that being selfish is felt and run on each other's heart and mind. The bottom line is, seek, change first within ourselves before looking at other things and everything will go on. You may share your kind thoughts on Cindy Jacob's prophecy by putting comment/s below. it is not anymore a prophecy . it was already mentioned by rody duterte that it will be bloody in six months as he eradicate all criminalities in the country.